After several days of attending the rigorous try-outs of Ginebra, Eric Rodriguez has finally re-entered the PBA. He was selected by Ginebra to be one of their new center. Eric will back-up Eric Menk and Yancy De Ocampo. The injured Billy Mamaril was deactivated by Ginebra to give way for Rodriguez. Snow Badua Tweeted that the Ginebra Gin Kings has officially hired Eric Rodriguez earlier today. He might suit up for Ginebra on Sunday against Petron Blaze. Mark Andaya on the other hand was instructed to stop practicing for the team. Congratulations Eric Rodriguez! Your fans will be very happy for you. To Eric's fans, what is your message to him? Write it on the comment box and we'll let him read your message posts. Thank you so much and God Bless. Just prove yourself to the die hard fans of Brgy. Ginebra and they will appreciate it. hustle,hustle,hustle,hustle,defense,defense,defense,rebound,rebound,rebound..yan ang tingin ko dahilan kaya ka kinuha ng BGK..goodluck! he may just be an import-defender, at best. this just proves that it's not always the taller (andaya) or more talented (bono) guys who are chosen but it's whoever is the best fit for the team. 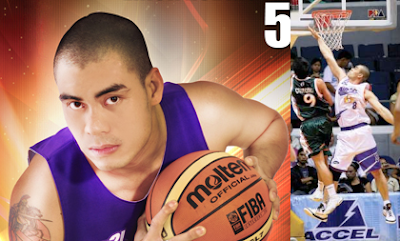 the rugged style of rodriguez is perfect for barangay ginebra. with the other big men of the kings still injured this will be his chance to shine. Gawin mo ang lahat ng magagawa mo upang mapatunayan na ikaw ang nararapat sa Ginebra at makakuha ng championship ang Ginebra. gudluck erick...iprove mo sa lahat na deserving kang mapunta sa ginebra...ibigay muna ang lahat or mas higitan mo pa ang best mo dahil ito na ang best team sa pba..kagatin mo ang break at wag mo ng pakawalan...wag kang mag alala suportado ka nming ginebra fans...welcome sa national team ng pilipinas ang GINEBRA KINGS..
yeah ! fresh legs ! this team is the best . fans plang palong-palo na . tama!!! just give your best shot!! basta hustle lang pare! wag lalamya lamya! galingan mo mamaya pareng eric!! !